Evernote is the fastest-growing note-taking technology out there, so it is no wonder that it is incredibly popular with genealogists. You’ll want to keep this handy cheat sheet close at hand so that you can take advantage of all of Evernote’s powerful capabilities. 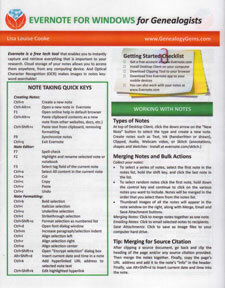 Lisa has designed this genealogy reference guide to be easy to use and chock full of ways to maximize your research note-taking.